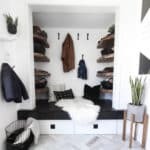 Do you have any spaces in your home that you just don’t know what to do with? You just don’t know where to start, so you do nothing and hope inspiration strikes eventually? That’s how I felt about my outdoor entryway. 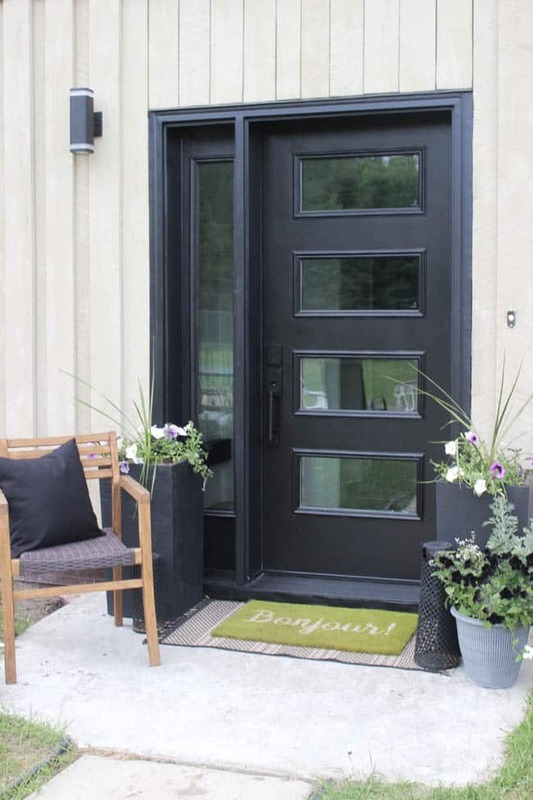 We finally replaced our door with a beautiful new modern black front door, but the outside was still totally lacking inspiration. Vertical brown siding, unfinished pathways, and a blank slate had me stumped. 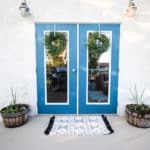 So I got brain-storming, and thought up 7 great ways to add curb appeal to your entry without breaking the bank, and then put my own tips into action! This was our exterior a couple of months ago. There are a couple of tools hanging around, because we were knee-deep in renovations inside, but there was never anything outside to draw people in. In fact, we almost always had guests knocking on our side door because this one wasn’t giving off that “warm welcome” vibe. Now that the modern entry is done, the inside is a dream come true! But the outside didn’t match … at all… lol. And we still had people knocking on the wrong door. So we had to make some budget-friendly changes! 1. Add an Outdoor Rug – Outdoor rugs are a great way to add style and they are made so that they are easily sprayed clean (no worrying about those muddy toddler boots!). Plus, they come in so many great patterns and colours now! I layered a couple of simple outdoor rugs and I LOVE the character they added immediately! 2. 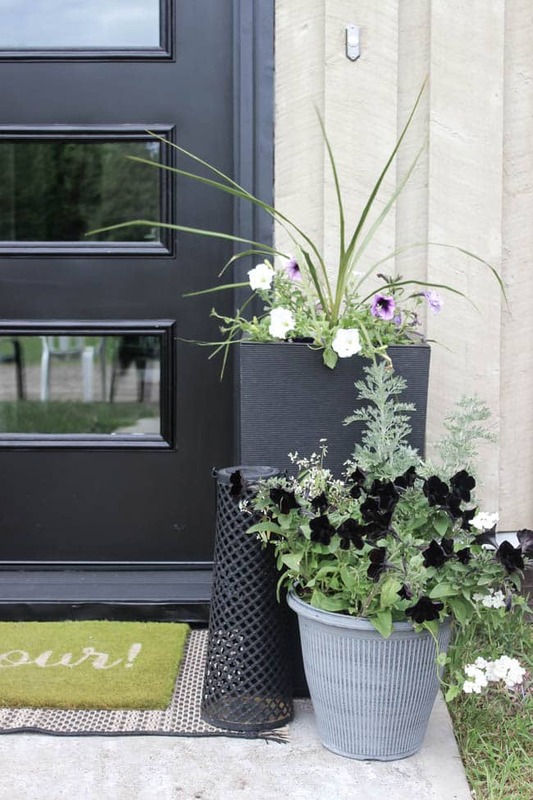 Planters – Planters filled with seasonal greenery or flowers is a great way to add colour and texture to your front entry. It’s also a great way to add height! 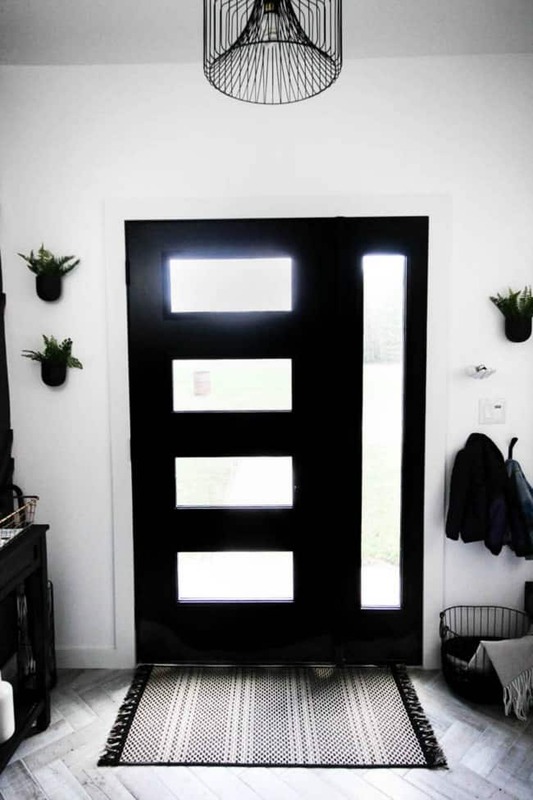 We picked up a couple of tall, affordable planters because I wanted to cover up some of the overwhelming brown siding at our front door, and wanted to accentuate the deep black in our new modern front door. 3. Wreaths – Wreaths are always welcoming! Add a pretty seasonal wreath to your front door to draw the eye up and add a personal touch. 4. 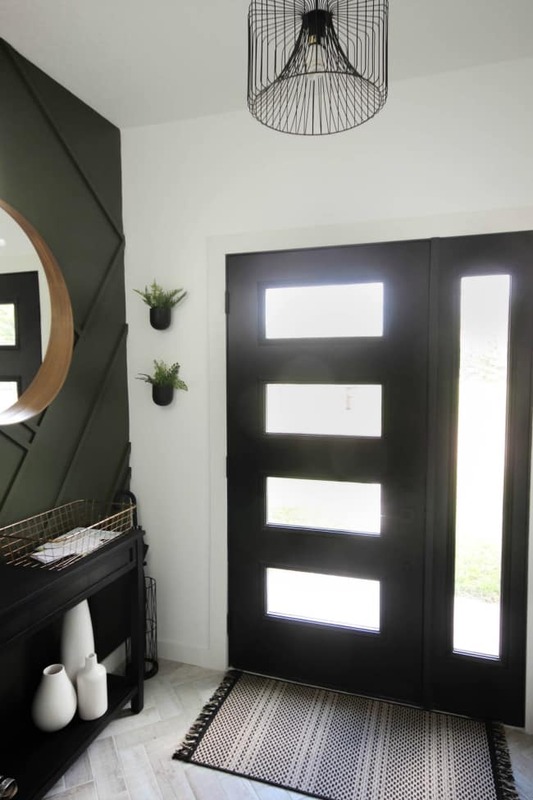 Lighting – A new sconce or porch light can really change the look of an entry and there are so many affordable options out there. 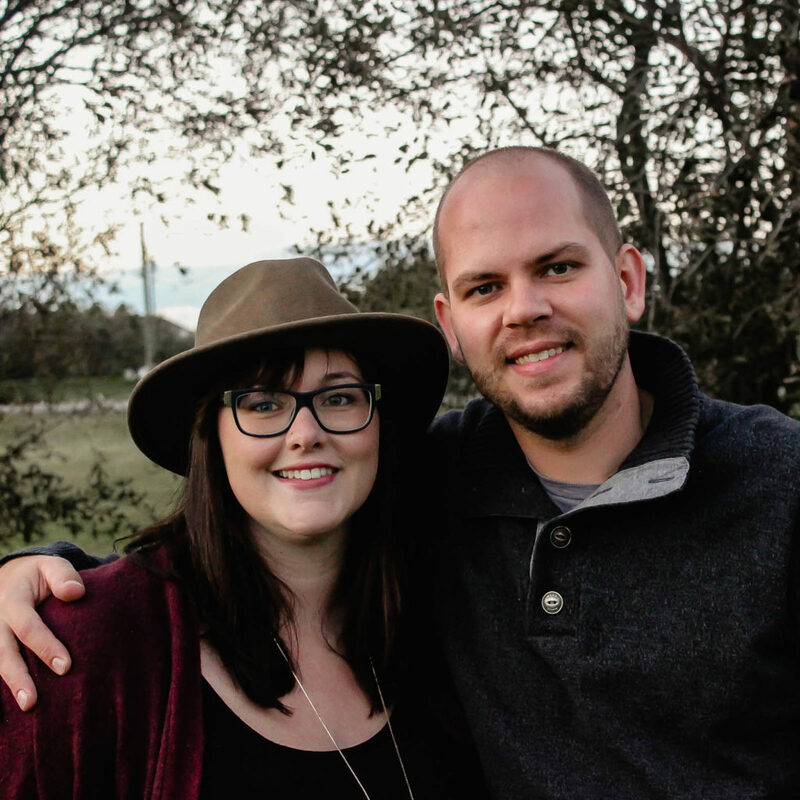 Our previous light was outdated and very far from my personal style. 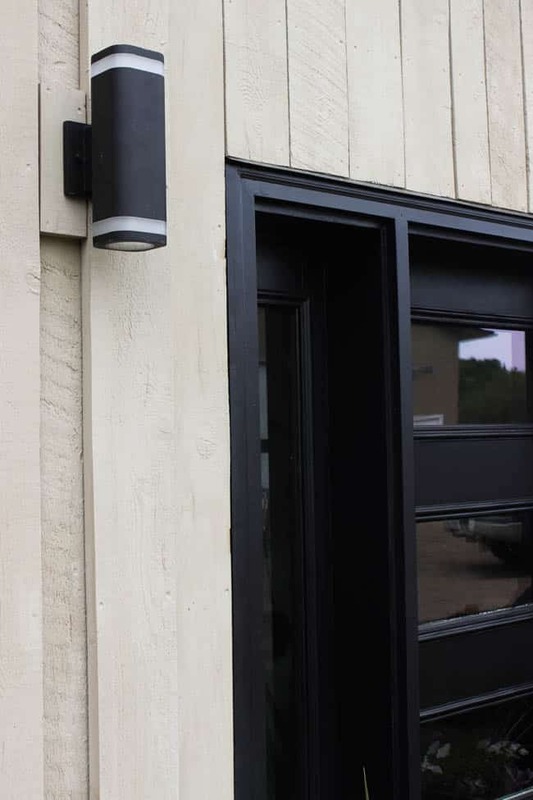 This light was a budget-friendly option that allowed us to make a quick and easy change and looks amazing next to our black front door. If you have a path, consider adding lights along the perimeter or at the edge of the porch too. 5. Mailboxes and House Numbers – These days there are mailbox designs for every style. 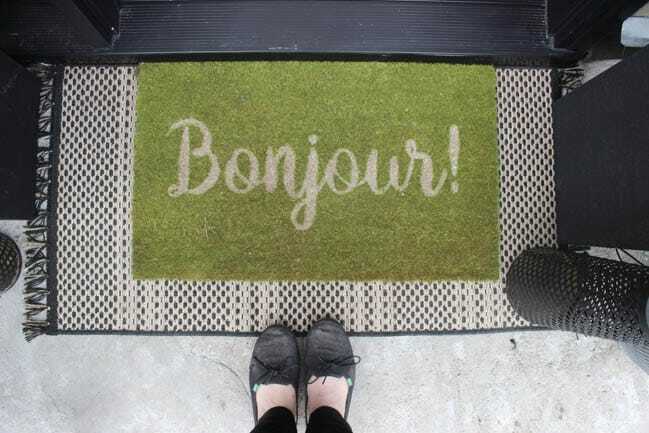 Pick a cute new box or DIY your own to add some flare to your entryway. There are also a ton of beautiful ways to display your house number! It doesn’t just need to sit on the garage – make a beautiful wooden sign or planter box with the numbers for your guests to find you. We live out in the country, so we don’t have mail delivered and our house number sits at the side of the road – otherwise I definitely would’ve added something to bring so beauty to the sides of our doorway! 6. 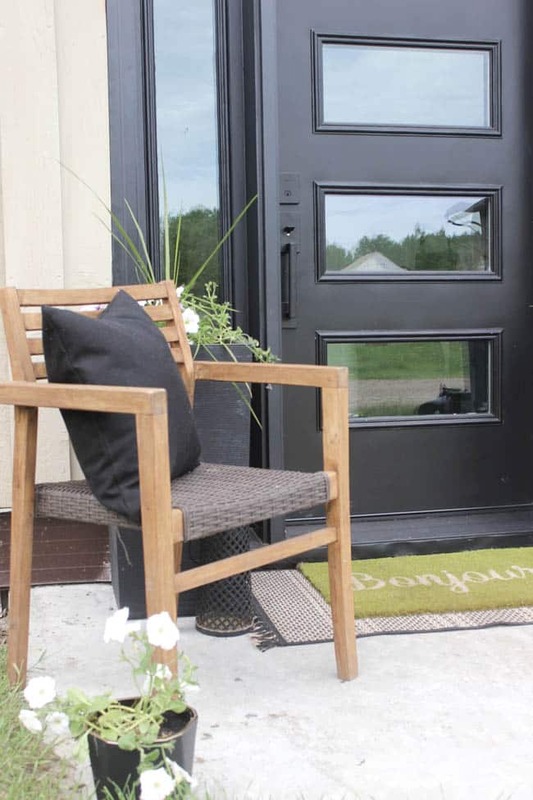 Seating – Unless you have a beautiful porch, you probably don’t spend a ton of time sitting a the front of your home, but even if you don’t use the seats there’s no question that they are welcoming. A stool, a bench, a bistro set, or a single chair. They are all inviting! 7. Outdoor Accessories – Bring your personality into the space with your favourite lanterns, candles, pillows, signs or gnomes! There are a ton of outdoor accessories available these days, but you can shop your home to find accessories if something new isn’t in the budget. 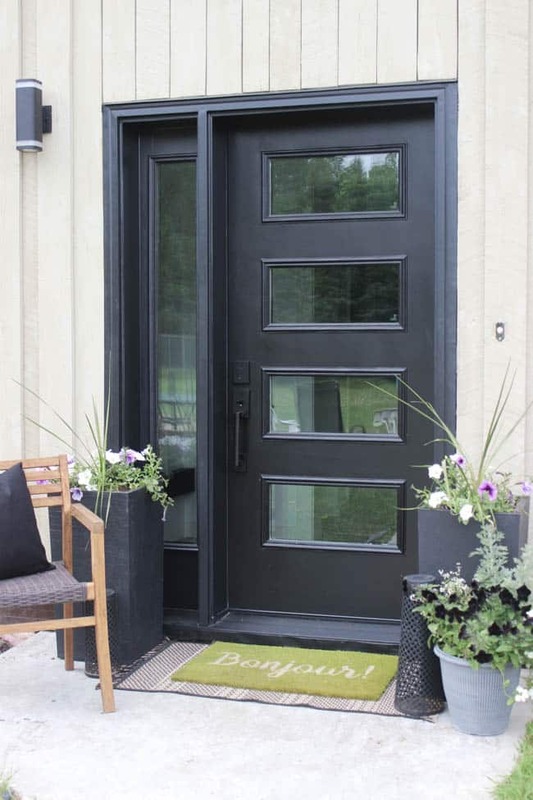 I hope these simple tips have given you some ideas to add curb appeal to your own entryway! 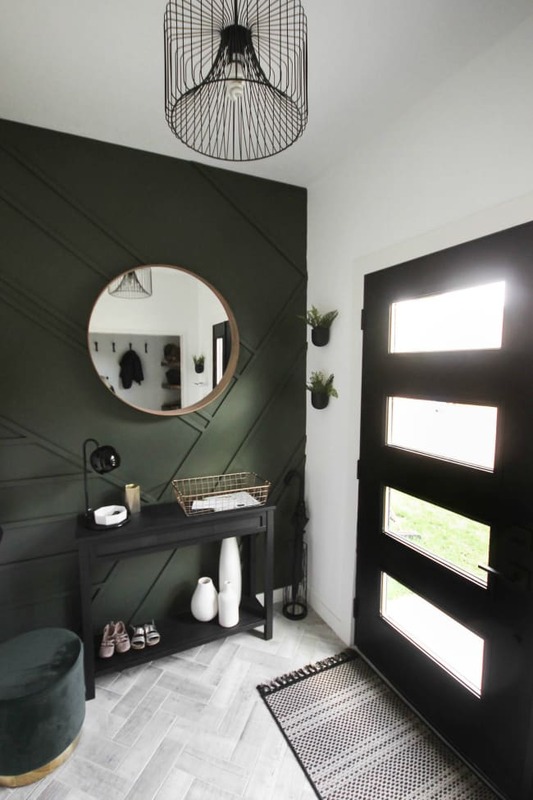 I have a beautiful modern front door that I love and finally some decor (indoor and outdoor!) to match it! Our Modern Entry Renovation is done! Come see the huge transformation! Hi Lindi. 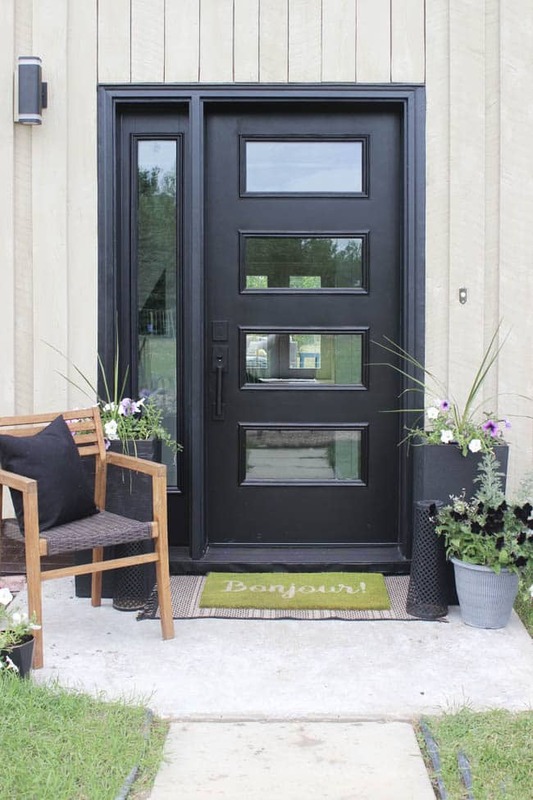 I love the idea of putting your home number in a floral planter in addition to having it on your garage door. Maybe one bug number on each hanging basket? Anyway, I bet your home is super lovely. Have a great day. 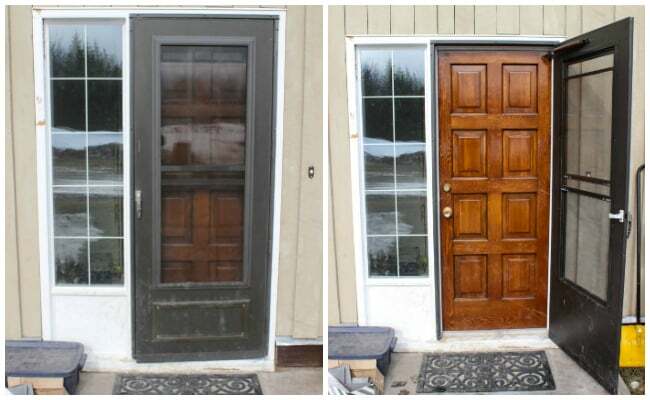 I really appreciate your great door front ideas. It is so posh and looking very beautiful. Feels like plan for my house.